One of the strange things that I've noticed about people with Asperger's syndrome is that when it comes to religion, they often fall into the categories of all or nothing. Of course, there's a plethora of individuality out there and not all people with Asperger's syndrome sit at extremes but there does seem to be a bit of a trend nevertheless. The aim of this post is to highlight some general themes and trends that I've seen. I'm not sure how much of what I've seen is down to Asperger's versus general opinions on religion but I'll be happy to hear your thoughts in the comments. 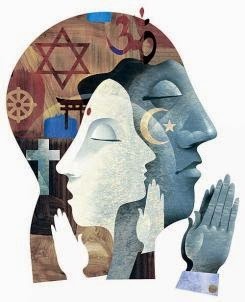 A highly religious person with Asperger's syndrome tends to be focussed mainly on the inward aspects of religion, such as prayer and good moral values. They may spend a lot of time perusing, memorising and quoting religious texts. I've noted that direct involvement with the church, synagogue or clergy tends to be in the form of very small on-topic discussions rather than fully-fledged social events. This is only natural given that people with Asperger's usually feel uncomfortable in crowded social settings. One darker aspect that I have also seen is; dubious morality where a person holds true to certain moral aspects of their religion, for example, covering their eyes during risqué scenes in a movie but then proceeds to accept less savoury experiences, such as paedophilia within their church or bullying, with fewer qualms. Quite often, these highly religious people become "self-censors" and choose their information sources very carefully. Anything which contradicts their personal take on their own religion is rejected and they pick and choose sources, including people to ensure that only their version is supported. This is very different behaviour to the normal all-consuming special-interest absorption favoured by people with Asperger's. Atheism is rife within the autism community and it seems, at first glance, to be far more widespread in comparison to the ratio of atheist/believer in the wider population. It's not that these people don't think about God, in fact it's more often a case of "overthinking". Atheists on the autism spectrum quite often lump the image of God in with Santa Claus and the Easter bunny. The physics of it all simply don't add up and coupled with the difficulty of staying still and quiet in church, this drives them away. The normal rules for special interests apply with atheists on the spectrum and if religion ends up becoming a special interest, you can expect them to delve into historic and scientific texts in order to find evidence. Atheists with Asperger's syndrome also tend to be more vocal about their beliefs and will happily explain why religion is false to anyone who dares to suggest otherwise. This can sometimes cause social problems, particularly when they are unaware that their comments are causing distress. Of course, not all people with Asperger's are consumed with religion, history or science and there are certainly plenty of people who occupy the middle ground. It just seems to me, that those without an opinion on religion are in the minority. I don't know the statistics, but I can certainly see plenty of vocal critics of Western/theistic religions on Internet discussions forums for Aspies. I suspect we (Aspies) are less attracted by the "social pull" of corporate religious life than NTs are, and especially any appeal to the emotions. So alot of the appeal of Western religious life fails to impress many Aspies. But while we have a reputation for being "rational", I suspect that quite a few might be mystical - inner peace is appealing when your mind is in constant overstimulation from the sensory and social environment. I am involved in the Western theistic tradition, but one of the things that attracts me most is the silence and solitude of the contemplative life. Unlike the stereotypical Christian fundamentalist, I am very happy with the science of evolution and the antiquity and vastness of the universe, etc. My former boyfriend with Asperger's was really into christianity. We both are serious christians, but the way he reads the bible is so different. He doesn't talk about the practical things in the bible, things we can apply to our lives, he reads is almost intellectually and makes connections between stories and persons that I have never heard of. His faith in God seems to be his special interest, it's hard for him to talk about anything else. When we were going out together, his focus was never on me, but on sharing the gospel with strangers in the street; in a nice way though, not pushy. But still, I was nowhere in this relationship and also he became too rigid in what he asked of me as a partner (based on how he read the bible). My son is on the very religious spectrum that you describe here. What you said is spot on. I notice it too. With him it's all or nothing. Although he differs on the social aspect. He is driven to social activities. It's an obsession with him because it helps keep his mind occupied from the intrusive thoughts that plague him. My husband and I are not Christians. He is an atheist and I'm drawn to Taoism. Interesting article! I was interested to read your thoughts on Asperger's and religion because I have pondered this topic many times. If I were to add a category to your list, I would add the agnostics. I've run into quite a few whose viewpoint runs along the lines of neither believing or disbelieving in the existence of God. In my experience, they tend to be less argumentative online about their beliefs than some of the "all or nothing" arguments you may see with those who would fall into the Highly Religious or Atheist category. For me personally, I consider myself a non-denominational Christian. I read the Bible, enjoy devotions and enjoy listening to Christian music. For the past few years, our family (3 of 4 on the spectrum) has regularly attended church and our favorite activities are listening to the sermons (from the top balcony) and the worship music. I suppose of the three groups you mentioned, I would probably fit into the middle ground, even though my faith is very important to me. What is most important to me is building a strong personal relationship with God and teaching my children through actions and devotions how to do the same. I have never been fond of people who try and force their religious beliefs upon others, especially when many don't as the saying goes, "practice what they preach." Specifically, my issues with an approach to religion that relies heavily on personal, emotive experiences with God. I know one man with Aspberger's who is very fanatical. This means that it's his version of the religion or no version. Unfortunately, he's in a position of authority and leadership. This has meant that he has put a lot of people's backs up and has distressed and upset many. He lacks compassion, empathy and understanding and believes that anyone who does not think, believe and act exactly as he does and instructs them to, is unacceptable in the eyes of the religion and of God. His rigidity makes him tiresome and repels people from him, yet he cannot see it. He is also involved in trying aggressively to attract new recruits, in a similarly offensive way. He is such a boring drag to be around that many have withdrawn from being in his company. It's sad really that he comes across as being so arrogant, judgemental and fanatical, but cannot see this for himself. At heart I believe he is a sincere person who lacks social skills, empathy, compassion and understanding. It's difficult to know how to help him, since he will not be questioned or challenged and believes he is always right. How can you help someone like this? I definitely don't believe people like him should be in leadership positions! I'm a Christian. Being raised in a Christian family helped me get a grasp of the basics of the faith, but I wasn't finalized in it until very recently when I entered a depression. I felt like my Christian faith and my Asperger's were conflicting with each other. I could try and change and get out of my bad habits and try and be a good Christian, but then I'd still be a bit different because of my Asperger's. Or I could try and find some Aspies, but I figured that since they were ALL atheists (generalizing, I know), then they'd reject me for being a Christian. I couldn't just get rid of my faith or my condition, but I felt like I had to find love and acceptance. Instead, though, I got that from God. One night, I was crying myself to sleep about something or other, and then I just felt the presence of the Holy Spirit. All of my doubt and misery was gone, and I felt like I had become a new person. I was technically a Christian before, but all of my worries and insecurities and shame were gone. I had been trying to understand God with my mind, through rationality and logic. For an Aspie, having a rational/logical support for religious faith is vital, but there is also an emotional, personal aspect to it. I think one of the other commenters said something about how they were uncomfortable with the personal, emotional experiences of Christians. I can relate. I thought that as an Aspie I wouldn't get to have that. I would have just to just work hard at being a Christian and get lucky, or I could just give up altogether. I thought that the whole "let God into your heart" thing was just neurotypical stuff. But it wasn't. God told me all this without really doing anything grand or amazing. Just like in 1 Kings, He spoke with a whisper. I like to call it the "perfect hug". It's what every Aspie is searching for but can't get--a hug that gives just the right amount of affection without being too overbearing. A hug that says, "I know the world is a harsh and scary place, but I promise to help you. I still love you, even though you're different and strange." God gave me that perfect hug, and I want every Aspie to realize that God can give it to them, too, if they just acknowledge that they can't fix themselves on their own. Fellow Aspies, I know that accepting belief in God is tough. The Bible is hard to understand and a lot of Christians know nothing about autism. They have a tendency to think that our idiosyncrasies are sinful, but neurotypicals are pretty sinful, too. In some ways, we Aspies are probably closer to God, what with our desires for morals and truth and absolutes. We just don't often get that the Christian God is the one we were searching for the whole time. I'm a Christian because I realize that even though I may have trouble finding a place in human society, God already knows exactly what He will do with me, even though I'm not quite sure myself. He has a seat reserved for every person at His table; all you have to do is let Him take you there. If you don't want to be escorted, then it's your choice. When I talk about my faith, I'm not trying to impose; I'm just trying to present it. While your observations aren't possibly completely false, Gavin, I think you missed the whole idea of God's love and acceptance of differences, although that's understandable if you haven't had that experience yourself. For me, I have no trouble saying God gave me Asperger's. He didn't do it as part of some curse, as other Christians might mistakenly believe (because they're NTs and they can’t see their own flaws, lol). God gave AS because it was a part of His perfect design; I'm only flawed in the world's eyes. God made me the way I am for His own purposes. I honestly don't know what you mean by self-censorship and dogmatism--I've only seen that in NT Christians, and even then only those who don't know what it's like to be marginalized--which is ironic because Jesus loved hanging out with marginalized people. My point is that even though an Aspie might not be able to find love and acceptance even among well-meaning NT Christians (who don't understand his/her condition and why they feel distant), God does, if you just let Him into your life. I know most people wouldn't want to do this or would think that God just can't be real, but I can guarantee that afterwards you get these feelings of contentment and inner peace--you just sort of know that even though you're different, you're not alone and everything is going to be ok.
One thing about the puzzle pieces I'd like to opine on, though. I know how most of us see the puzzle pieces, but I think that's because most Aspies are looking at it within a societal context. For me, that's not what it is about; the puzzle piece is not about fitting into society--where I only can sort of fit into the puzzle, at best--but where I fit into God's plan. God made the puzzle, and I'm a perfect fit for what He wants me to do. Knowing that I don't have to fit into society and instead get to have a place in a higher purpose, bestowed upon me by a perfect and loving God, is very comforting, especially when I realize that the puzzle is not complete without me. Your thesis in this piece caught my interest. I’m not certain that your thesis is true, but I have an instinct as to why Aspie’s might tend to believe deeply or not at all. I’m an Aspie. I grew up Catholic and from my teenage years until I turned thirty, I was fairly devout. When I turned thirty, I was diagnosed with multiple sclerosis. I also figured out I was gay. Later discovering I was an Aspie helped me sort out why it took me so long to figure out I was gay. But this discovery wreaked havoc on my spiritual life, as obviously Catholicism is not particularly tolerant of homosexuality. What I discovered was that Catholicism worked for me because of the distinction between the church as a group of fallible humans and as the metaphysical body of Christ. Catholicism is not a particularly intrusive religion, particularly as it is practiced in the United States. One can go to mass at any parish, pray, take one’s communion and go about one’s business. Yes, parishioners and priests squabble like any normal groups of organized humans do, but that was the fallible part, that one can opt out of easily enough. You could join in if you wanted, but you didn’t really have to. The truly transcendent part, the perfect part, one touched in prayer and meditation. In essence, in being the mystical body of Christ, Catholicism offered a community without community. I experienced all the joys of membership without all the intrusion of fallible, annoying humans. I could be with God, theologies, liturgies. I could try to greet each person with love, but not being enmeshed in a deep relationships with them, when their petty humanity emerged, I could retire from them. They would learn in the fullness of God’s time. It was a community in which I didn’t actually have to get along with anyone, because it was purely transcendent and ethereal. I just had to have faith that God would make the squabbling individuals into the image of that heavenly body in the fullness of time. This is different from many other people’s experience of Catholicism. I didn’t go to school with abusive nuns. I went to public school. The only nun I ever knew, Sister Corona, my first communion teacher, was sweet and lovely. I was never molested by priests. I just never ran into the parts of Catholicism that have wounded people in so many other instances. A good friend of mine, who I grew up with and I believe is also an Aspie, was raised Mormon. His church regimented virtually every aspect of his life. As a result, he rebelled. He is not an atheist, but has very little respect for organized religion. I wonder if it is as simple as having that level of freedom versus oppression. Religion offers organized, idealistic teachings that can help orient life toward meaning. They also offer organized humans with everything that is not ideal in the human condition. Given the Aspie affinity for ideas and their struggles with human community, extreme responses would seem to be natural. Your bias against atheists is showing. Using a loaded word such as "rife" was a clear sign. Then to say something as clearly prejudiced as suggesting atheists are "overthinking it," you are prejudiced against atheists. You don't get it. Atheists are NOT overthinking "it." They are simply THINKING. LOGICALLY. RATIONALLY. SCIENTIFICALLY. And yes, they are absolutely correct to lump a fairy tale magic being such as a god whether that god be Jesus, Mithras, Odin, or Shiva in the same bag of silliness as Santa Claus and the Easter Bunny. Brian P. Most of the time my thoughts are rather atheist. I have no difficulty accepting that there are higher beings. I don't necessarily accept that they have any vested interest in humanity. I have no problem accepting the existence of historical people such as Jesus. Again, I don't necessarily look upon him the same way that others do. I have a best friend who is deeply religious and another who is atheist. I consider myself the balance and I have no bias at all. In fact, I used to describe my religion as theoapathetic. These days, I just say Jedi. You may be reading a little too much into my style of writing. I got diagnosed a week ago, I'm 38 years old, I'm still coming to terms with it. Lots of things are starting to make sense to me, this post was one that I could relate to so much. Hi, first-time reader, just getting acquainted, going through the back catalog! I'm happy to chime in here as another fellow Aspie. I was raised Christian and took my religion studiously - I tried to learn a lot about the Bible. I always enjoyed the liturgy in the church services - I don't know if I thought about this at the time, but it seems like the routine and lack of other distractions were helpful for me. I want to add that I wasn't of fundamentalist views, since my denomination was moderate and more accepting, as was my family. Also, my congregation was one of the few environments growing up where I felt accepted and not bullied a lot. I had a lot of friends in my church. On the other hand, while I was in college, I started to feel like religion was not making as much sense to me. Where I grew up was more conservative and it was widely assumed that everyone was religious to some extent; perhaps going to college in a more liberal atmosphere gave me a different set of ideas for comparison. It was mostly when I studied other religions that my own Christianity felt less assured. The more I studied other religions, the more I felt like my own faith was more a human and less a divine phenomenon. When I first was an atheist, it was definitely a special interest of mine and I went way overboard in talking about it to people, writing about it, reading on the Internet and arguing with people on the Internet about atheism. I wasted a lot of time on the subject. Eventually, while I still consider myself an atheist, I started to have a different perspective. I realized that I was unfairly generalizing about religion when many people have different opinions and practices and that it's not right to broadly categorize people in this way when religion is such a varied spectrum. Plus, I started angering some of my friends and family, I had been dating a Christian woman, and it was getting tense sometimes. It was clear I needed to take a breath and consider making some changes. As you can probably tell, I still enjoy discussing religion and secularism, but hopefully I am better off following a more broad-minded tack these days. I am trying to judge people less by their beliefs and more by their own morality. I don't believe that it's helpful to stereotype people and I regret doing so before. I hope I am evidence that some atheists who get carried away can change their approach. Then finally returning to Christianity over the last six months. I had to find my own patj and study it out in my mind. In the end it was the emotional pull of Christianity, at a time of depression that brought me back to Christ. Unless you let go and allow yourself to feel and practice religion and not just study it it is jard to put into words how amazing Christ is personally to every Christian believer through the Holy Spirit. I have just one, brief, comment. At least one person suggested that God gave them Asperger's. This is not true. God doesn't give anyone any disease or disability or malformation or disfunction, etc. It's a result of sin. Since Adam and Eve sinned, sin has been degrading life on this planet. Our bodies don't last as long as they used to. Diseases are more varied and easier to contract. Less people are born as neurotypical and more are born with conditions like ASD and ADD and bipolar, etc. God didn't do this to us. He helps us deal with it. I just felt that needed saying. I was adopted into a fervent fundamentalist family in infancy. I bought into it as a youth, but at 20 the doubts and contradictions piled too high and I stopped calling myself a Christian. This caused a huge problem in my family and for the next 8 years I struggled to reconcile things and get back inside the tent. I didn't make it, but I've kept on thinking about it ever since. I'm 62 now and here are some of my working conclusions. You can decide where to place me on your spectrum. 1) it's impossible to know whether there's a God or not, atheism is just as unprovable as any religion. 2) if there is a God(s), it's impossible to know what they want. You can guess and that guess can have great meaning for you, but it's just a guess. 3) humans don't have a special place in God's plan. We are part of the plan, perhaps, but surely not the point of it. 4) Humamns don't have a choice in whether to follow or not follow God's plan any more than ants or daffodils. We, and everything we do, all the good stuff and all the bad stuff, is the plan. 5) Organized religion is social technology and it can be very useful in many ways, but eventually it becomes obsolete because society changes and has different needs since the original design. Monotheism, imo, has reached obsolescence. 6) As long as we continue to base our social policy on "What God wants, we are doomed to remain a primitive society. A step in the right direction would be to fully claim ownership of what we as a society and as individuals want. A very beautiful response. I'm trying to understand a very religious aspie and this really helps .I.ll show her this and hopefully we can discuss. Thank you for sharing.